2-3 Day Trail Rides with the Wild Horse Sanctuary, To raise money to support wild horses, this Northern California sanctuary offers 2- and 3-day weekend pack trips to the public, as well as a 4-day cattle drive. Each day ride the trails created by the wild horses and burros through pine and oak-studded hills and volcanic rock out croppings near Mt. Lassen. Base camp consists of frontier style sleeping cabins and a "cook" house. 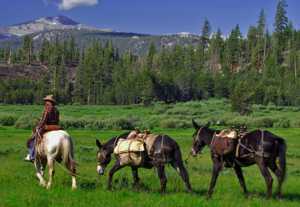 Tuolumne Meadows Ride, 5 days/4 nights, July-August. On this adventure you'll spend five days wandering through one of the most beautiful places on earth, Yosemite National Park. These trips explore the uncrowded back-country along the John Muir Trail. Black Lake-June Lake Horse Drive, 4 days/4 nights June, September. Join the group as they herd about 100 head of horses and mules. Your tents and gear will be transported each day and the leaders will be waiting for you as you drive the stock into camp. 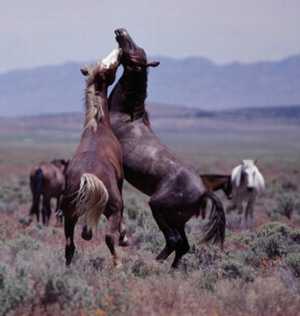 Owens Valley Horse Drive, 4 days/4 nights June, September. 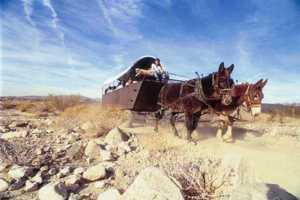 Drive 80 head of horses and mules over 80 miles from Owens Valley to Rock Creek or Red Meadows. This drive moves the herds between the winter range in Owens Valley and the summer headquarters in the High Sierra. Redwood Coast Ride, 7 days/6 nights from May to October. 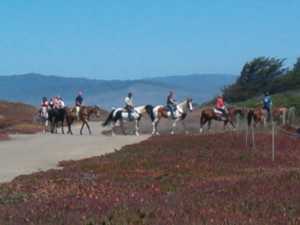 Revitalize yourself with a riding vacation out of the charming seaside town of Mendocino along the Pacific Ocean. This is a progressive ride with no camping. Suitable for families. Mustangs in the Wild, 4 days/3 nights, May to June. On this vacation ride you will track and observe the unbridled and untamed Mustang in its natural habitat - the wilds of California, namely the Truman Meadow area of Inyo National Forest. High Sierra Wilderness Pack Trips, 7 days/6 nights, June-August. Take a week, pack up, and really get away from it all on thie week-long pack trip into the Eastern High Sierras of California. Costanoa Coast Getaway, 6 days/5 nights from April-December. Explore the beauty of California's scenic coastal trails while enjoying the comfort of the Tennessee Walker's unique "rocking chair" canter.